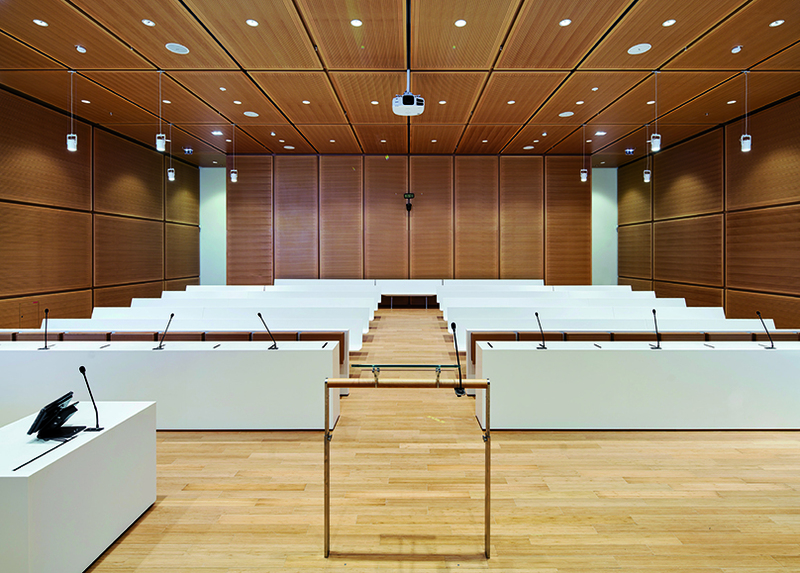 The Tribunal de Grande Instancein Paris has moved its installations to the Batignolles neighbourhood, in the 17th arrondissement of the French capital, where KRION® has been used to create much of the furniture in these new headquarters. Established in the Middle Ages in l’Île de Cité, at the heart of Paris, the Tribunal de Grande Instance (TGI) has moved to its new address, establishing itself in a spectacular 160 metre tall building created by the Renzo Piano Building Workshop (RPBW) international architecture studio, a 38 floor tower with three different levels, one on top of the other. KRION® has formed part of this project, a material used to create and design much of the furniture inside. Thanks to its multiple properties and applications, several rooms have benefitted from this solid surface; we find the compact mineral from PORCELANOSA Group transformed into the chairs and benches located in the entrance and lower lobby (considered high transit area), on the countertops of the various bathrooms, and in the covering of tables which will be used by lawyers, judges and judicial personnel. By using the pure white colour of KRION® to create this furniture, as associate architect Stefano Marrano says, “the aim was to associate the idea of justice with purity”. This new building will contain both the hearing rooms and the offices of the judicial institution. With the idea of combining both public functions and private offices, the project by Renzo Piano Building Workshop, with its size and status, intends to establish itself as a point of renovation and development for the whole Clichy Batignolles area in Paris.